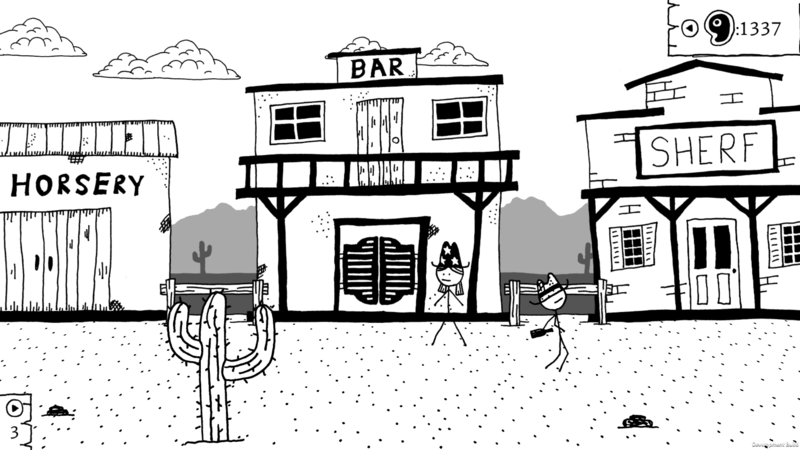 Never a stranger to less than realistic portrayals of classic moments in history, I was very intrigued by the prospect of playing West of Loathing, a game that by name alone already had me chuckling. Set in a crudely drawn but incredibly charming world of stick figures making a living in the Wild West, you step into the shoes — or whatever it is that stick figures wear on their feet, so I guess nothing — so correct that, you seep into the single line that makes up the leg (and foot) of a lone person (a girl or a boy) whose heart is set to hit the road and make a fortune out in the dangerous west. But first, you pick one of three starting classes. I went with the snake oiler, who can both shoot and handle snakes, which in my book sounds like a great combo for trying to make a living out in the desert. And sure enough, those skills came into play quickly, proving their worth quite well during the first few combat encounters. 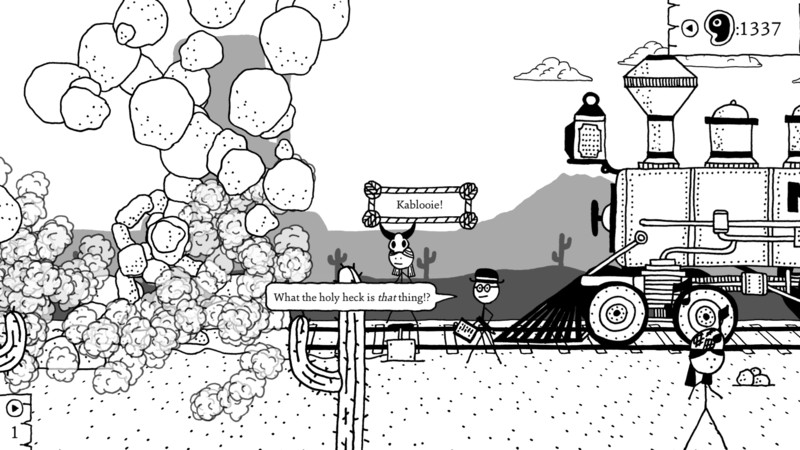 West of Loathing is pretty straightforward in terms of RPG combat, starting with only a couple of different attack options and not much in a way of defense, other than being able to drink a potion you might have. As a snake oiler, putting a snake out on the battlefield helped my odds of survival while I fought on my own, which thankfully didn’t last long, because as soon as I stepped into the first town, Crazy Ol’ Pete volunteered to join me. He eventually became my front of defense in every single battle, giving me an extra chance to attack before all of the enemies zeroed in to attack me. But surely enough, the further you progress in your chosen class, more skills start to pop up for use during combat — in my case, the most useful of them turned out to be dead eye, if not only because it makes fights go by quicker thanks to the punch that my shots packed. Then again, West of Loathing isn’t all about battles. In fact, the further you get into it, the easier it becomes to avoid a lot of potential encounters by making use of the skills you develop by spending the points you earn fighting, such as in charming/tricking, which can help you talk your way out of a dangerous situation, as well as other sneaky possibilities. But if you prefer to let your guns, fists or whatever else and settle matters fighting, there’s plenty of that to go around as well. Sadly, the fights never really grow in terms of depth. Sure, further on the game starts throwing out status effects like poison, but since fights don’t tend to last long at all, there’s not a whole lot of room to really be strategic. Most of the times, your character will either be overpowered and will easily trounce whatever is unlucky enough to step into your way, or suffer the opposite, dying right away. On the other hand, I felt that the witty writing is what kept me playing West of Loathing. It’s an incredibly silly game at heart, and one that doesn’t stick to any form of realism. It’s a satire that just happens to take place in the Wild West. Without running the risk of spoiling some of the stuff that happens in the game, it’s safe to mention that there are some fantasy elements thrown in for good measure, and these are not limited to the tropes that we’ve come to see in turn-based RPGs like googly-eyed monsters and magic. And even though the art style doesn’t particularly lend itself to much visual variety, the banter between the protagonist and the folks he runs into (as well as the many bits of text you click on) help give flavor to what could just as easily been very one note. It’s thanks to all that humor and personality that West of Loathing keeps going. There are lots of quests to partake, but they usually boil down to exploring a previously unknown location out on your map, or buying a specific item elsewhere and delivering it, so it’s the in-between back and forths that really made me want to go through the same rigmarole during the few hours I spend playing. While it’s not a knock against the game, per se, there’s obviously a certain amount of expectation control you should enforce before you dive into West of Loathing. It isn’t a very technical RPG, nor is it an incredibly rich adventure game. And honestly, I don’t think either of those are the true point of the game. It might dip its toe nail into both, sure, but its true intention seems to be to deliver a humorous experience that’s easy enough to get through, but with enough writing to keep you interested. In that regard, it excels. While I would have preferred to have had some more ease of convenience features like some sort of journal or quest tracker to keep track of what I was doing, as well as some of pop-up letting me know I have enough XP to unlock a new skill, I can’t say I didn’t enjoy my time clicking way at West of Loathing. For as mundane as its gameplay is, there’s an undeniable charm to it that helps at least set it apart from other simpler to play adventure RPGs.